SERVED: I've been a loyal SYTYCD watcher since season 2. While sometimes I don't agree with elimination decisions I usually get past it and let the show go on. This past week, however, was BS. Billy Bell became yet another casualty in the season of injuries but his doctor did say he could dance if he felt up to it. Billy chose not to dance, which was convenient since he got a step routine that he would've looked like such a goof doing. B-boy Jose performed 2 routines it wasn't good in either. He has a lovable personality, but on the technical side he just can't hang. Jose, Billy, and Robert found themselves in the bottom 3 this week and the judges had to make a choice: eliminate the person who chose not to dance or eliminate someone who isn't improving except in his own style. 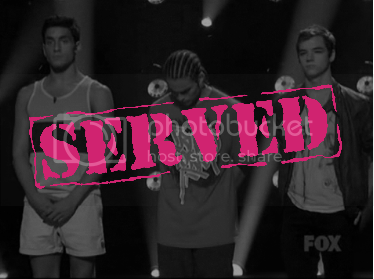 The judges chose to eliminate no one. ARE YOU KIDDING ME?! I am SERVING SYTYCD for a total cop-out. Make a decision. Now this week a top dancer could be in jeopardy since you chose to keep 2 people who should've been eliminated. Let's re-look at this. I get that the judges probably felt insanely guilty sending Jose home against a guy who didn't dance, so I guess I might have to come to terms with that. But let's face the facts about Billy: he's been in the bottom for like 3 weeks in a row. He would've been in the bottom again this week had he danced and you would've sent him home. He CHOSE not to dance, yet leapt all over the stage after being declared safe. Some sort ankle, huh? I think So You Think You Can Dance couldn't grow a pair of cohones to make an actual tough decision, and this is why I must SERVE the show.